Ob für einen romantischen Kurzurlaub für zwei oder einen Familienurlaub für sechs - das Beach House ist Ihr Zuhause. Es verfügt über zwei private Schlafzimmer (ein Kingsize-Bett und zwei Einzelbetten) und zwei Bäder. Es gibt auch zwei Couchbetten im Wohnzimmer. Es verfügt über eine voll ausgestattete Küche und eine 500 Quadratmeter große Veranda, um die unglaublichen Sonnenuntergänge von Sandy Bay zu sehen. Das Haus ist komplett ausgestattet mit Bettwäsche, Kabel, WLAN, Klimaanlage, Handys, dem Reinigungsdienst unter der Woche, Abholung vom Flughafen und Trinkwasser. Das Anwesen befindet sich in A Six Acre Garden of Eden mit über 40 Obstbäumen, Palmen und einem eigenen, 300 Meter langen Privatstrand. Das Anwesen ist außerdem mit einem Wachmann und einem gebietsansässigen Immobilienverwalter verbunden. Das Anwesen befindet sich in der Marine Reserve. Das Riff ist 100 Meter vom Dock entfernt. der Delphin-Stift etwa 50 Meter schwimmen. Eine ganztägige Haushälterin steht möglicherweise zum Kochen, Reinigen und Babysitting zur Verfügung. Anthony's Key ist zwei Blocks entfernt, ebenso wie die Octopus Dive School. Die drei besten Restaurants sind drei Gehminuten entfernt. Taxis sind 1 $. 50 pro Person. Das Anwesen liegt nur 10 Minuten vom Flughafen und Coxen Hole. Wir haben auch ein anderes Haus mit zwei Schlafzimmern, etwa 100 Meter vom Strand entfernt, neben einem Bach und auch ein kleines Effizienz-Ferienhaus namens The Cabana am Meer mit einem Bad, einer minimalen Küche und einer vorderen Terrasse mit Blick auf den Strand. Blue Bahia, Tranquill Seas und Anthony's Keys sind zu Fuß erreichbar und zum Frühstück, Mittag- und Abendessen geöffnet. We thoroughly enjoyed our stay at The Sanctuary in Roatan. The house was located in walking distance to our dive shop, Octopus Dive School, as well as other beachside restaurants. We loved watching the dolphins at Anthony’s Key while hanging on the porch in the hammocks. The house is well worn with some needed updating but we knew this was the case due to past reviews. John & Christy were very helpful with the house as well as suggesting restaurants and activities. Overall our family loved Roatan and hope to return soon to continue our diving adventures. The Beach House needs some TLC but the view, snorkelling, and staff were super. 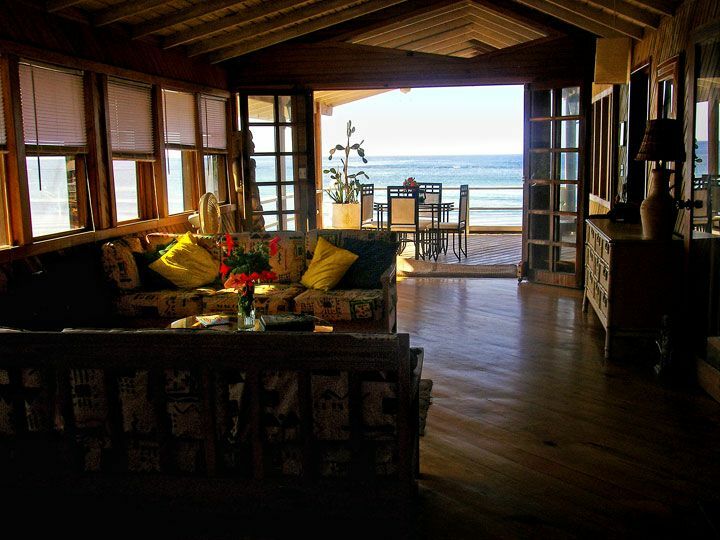 We stayed at the beach house, Sanctuary in Sandy Bay for a month. John and Christie plus the rest of the staff were responsive and helpful, checking with us daily. Lots of tips on what to see and do in the area. The beach house is in need of some updating and maintenance. The kitchen ( countertop and butcher block need replacement ) and living room need updating... living room furniture cushions don’t fit properly on couches, linens are worn and generally the place could use some TLC. That being said, the location is great...quick shuttle or collective into West End or walk to several restaurants. The view from the huge comfortable deck is spectacular. Between the dolphins and sunsets it was hard to beat. Excellent snorkelling right from the beach or dock. Best ever! Lovely ocean breezes so we didn’t use the air conditioner. Loved the fresh coconuts and bananas provided from the property. We felt safe and taken care of...All in all, a good stay at the Sanctuary. We thoroughly enjoyed our 4 week stay at the Beach House in the Sanctuary Compound. Beautiful views of Anthony's Cay, sunsets, the reef etc. We loved the easy access to the snorkeling, as well as into West End and Coxen Hole. John and Christy couldn't have been more helpful and responsive to all our requests and feedback. The house itself was good for most of our needs, however it was definitely tired around the edges, particularly the kitchen counters, the chopping block (both health hazards! ), some utensils were missing, one of the beds and a key board in the deck required repair. Once all these issues were resolved we were more than satisfied with our stay. The property is exactly as pictured and described. We were picked up at the airport by the manager and he took us to a market to stock up on what we would cook during the week. John, the resident manager was most helpful and checked in with us each day to see if we needed anything and if there was anything he could do to assist us. He lives "across the street" and really made an effort to be on and about the property every day. The house is comfortable and has excellent facilities. The kitchen had every pot and pan we could ever want to use. The building is traditional and is very much open air and has a rustic cottage/cabin feel to it. We were on stilts so all of the living was 2nd floor. Our bed was excellent, the bathrooms and kitchen in excellent working order. The gardener brought us two fresh coconuts every day for a healthful drink of coconut water. It's good for you! The view from the deck is a spectacular look at open ocean, sunset, and to the right an always fascinating look to a facility where dolphins are being trained. The Beach Grill is a great place for meals you want to eat out and is a few minute's walk down the beach. All in all, it was a terrific place to stay, clean, comfortable, quiet and relaxing. We highly recommend this vacation stay. Thanks to John and Cindy for connecting us to a tour guide, fishing guide, horseback riding, and of course transport, Johnny and Omar for keeping us in coconut water, and of course the "donut lady" for making our stay at the Beach House an experience not to be forgotten! We loved the people, the area and the wonderful reef. A quick snorkel will take you to this unforgettable site, not to mention the dolphins swimming nearby and the boys on the beach playing soccer. A great spot for relaxation. Blue Bahia, Tranquill Seas und Anthonys Schlüssel sind alle zu Fuß erreichbar und zum Frühstück, Mittag- und Abendessen geöffnet.